Today we give our review for the Incredibles 2! The first 8 minutes is spoiler free so if you haven’t seen it yet you can pause it there. The rest of the time we spend going through the different parts of the movie that stood out to us for various reasons. We also give our thoughts on whether or not you should bring younger children to see this movie. There are some scenes that can be intense for some viewers and if you or anyone in your family have certain medical conditions be aware that there is a pretty intense strobe effect in the film. Overall we enjoyed it and we think you will too. John Lasseter will step down from Disney by the end of the year. We made it to 100 Episodes! In this episode we answer your questions. A few episodes back we asked for your questions or suggestions for topics that you would like for us to cover. Keep them coming! podcast@travelingwiththemouse.com. We home that this episode will help you get to know us a little better. We answer some questions about ourselves and our love for Disney which sparked some really good conversation. We will see you in Episode 101! May the force be with you in this special Star Wars edition of Traveling With The Mouse! Since today is May the 4th aka Star Wars day we decided to spend this episode talking about the live action Star Wars films and ranking them from 1-9. We may need to revisit this once Solo comes out in a few weeks. See if you agree with our choices as the best and worst Star Wars films! 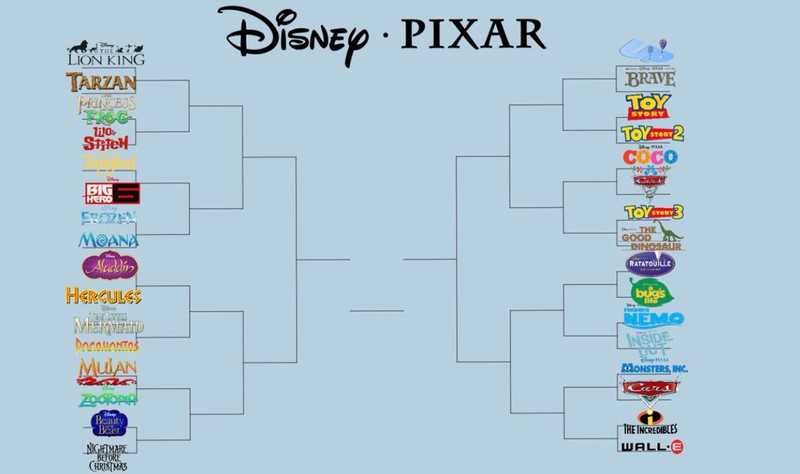 Today we discuss the latest Disney news and we give our picks on a viral Disney vs. Pixar March madness bracket that is making the rounds on the internet. Click Here to view the bracket and follow along with us and let us know if you agree or disagree with our selection as the winner! Now that we have both seen Star Wars the Last Jedi, It is time for us to give our full review of the movie. Our opinions do differ although we do agree on the major plot points of the film. This is a spoiler discussion so if for some reason you haven’t seen the movie just be aware that we talk about everything. We break down the movie and talk about the good and the bad. Let us know what you think of the last Jedi? Who do you agree with more?